Meriden paper manufacture EPOS rolls to fit these systems. An Automated Teller Machine (ATM), also known as automatic banking machine (ABM), Cash Machine, or Cashpoint, is a computerised kiosk primarily dispensing cash, it also provides customers of financial institutions with access to account information in a public space without the need for a cashier, human clerk or bank teller. Meriden paper manufacture ATM rolls to fit these systems. Gaming, Betting and Lottery Terminals have been a growth market over the last 10 years replacing flat pack cards. Meriden Paper print and manufacture rolls to fit systems such as TouchBet, Cyberview, Gtech and many other hardware applications. Bus tickets, Trams tickets, Admission tickets are all widely used. Penalty Charge Notice (PCN) Systems as well as Tachograph Rolls are niche markets that we also service. 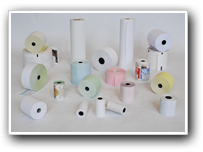 Meriden Paper supply rolls suitable for use in Wayfarer, Almex and ERG systems to name a few. 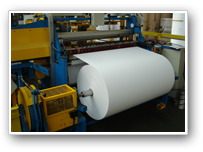 Meriden Paper manufacture and supply a wide range of plain paper data processing tapes such as Computer Tapes, Bakery Tapes, Ream Counting Tapes, Book Hollows and other bespoke narrow slit product. Our minimum slit width is 9.5mm.